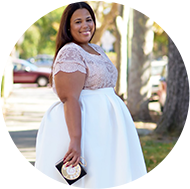 Congrats to Glittergirl both a reader and a follower of the "The Curvy Girl's Guide to Style. She has won the Norma Kamali jumpsuit. Stay tuned for more contests to come!